Dr. Mark Coppenger became the pastor of First Baptist Church in El Dorado in 1983, and as a young and enthusiastic pastor he brought fresh changes to the church. The former pastor Dr. Don Harbuck had served the church well for 29 years, but seemingly in the last few years of his service the church had become complacent and lost some earlier zeal for soul winning and missions. One of Dr. Coppenger’s priorities was to re-focus the church on personal evangelism, and a few members began receiving training in door to door witnessing using the program Continuing Witness Training (CWT). It took about a year before the changes began bearing fruit but those involved remained faithful. Along with other changes, a greater personal involvement in short-term overseas missions occurred. At that time the Arkansas Baptist Convention had a cooperative effort with the Southern Baptists in Brazil, and that partnership was called the Amazon-Arkansas Partnership Mission. Our church began making plans for its’ first mission trip to Brazil scheduled for August, 1986. Cathy and I had never been on an overseas mission trip either separately or together and were convinced that this was the Lord’s will for us. Our children were old enough for us to be away from them for the 10 days necessary to make the trip. Our church was combining forces with members of Three Creeks Baptist Church to go far down the Amazon into the state of Para to a small town named Redencao (Hay’ den saw). We began having planning meetings in April, and by this time there were a total of 30 people committed to make the trip. The purpose of our mission was to begin the building of 2 churches in Redencao and to send teams doing door to door evangelism. In addition to Cathy and me, my brother Berry Lee (Bubba) and his youngest daughter Becky made plans to go. Years before Bubba had made a mission trip to Panama where he did medical mission work to the Kuna tribe on the San Blas Island. 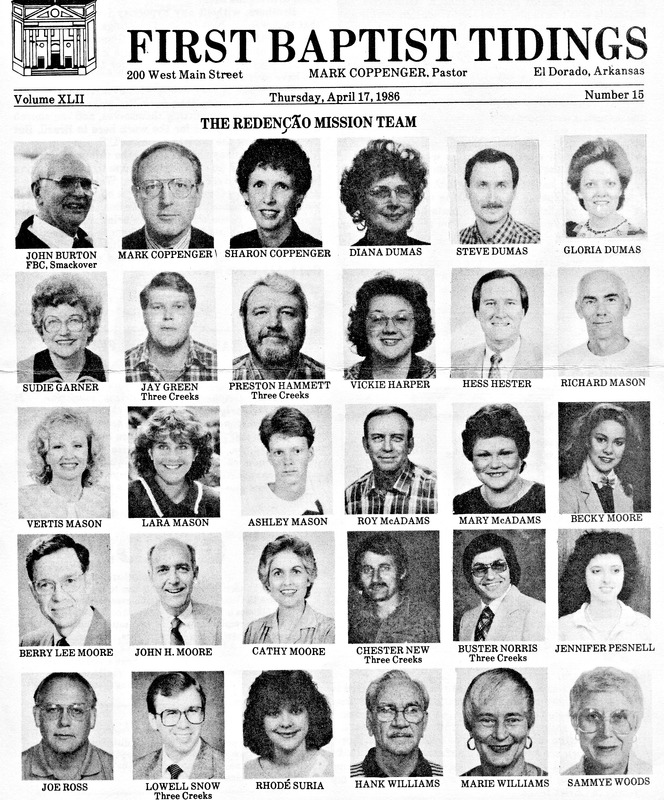 The photo above shows the entire team and includes Lowell Snow, the pastor of Three Creeks Baptist and 4 of his members. As part of our preparation for evangelizing, each of us wrote our personal testimony of salvation which was translated into Portuguese and printed on a single sheet with English on the front and Portuguese on the back. Each missionary had multiple testimony sheets for distributing in airports, in shops, on the streets and in the homes we were to visit. In our planning meetings, we had people with experience in Brazil tutor us in the language, customs and cultural differences we would encounter. Those meetings helped also in bonding the team and giving us opportunities to commit ourselves in prayer for the work the Lord would have us do. Cathy and I wanted a few days of rest and to spend with her mother before leaving for Brazil, so we drove to Fort Lauderdale with Mary K and Ginny. On the way down we stopped in Kissimmee to briefly visit Cathy’s sister Nancy and her husband Norman and to see their beautiful new law office that Norman had designed. John Aaron was already in Fort Lauderdale having spent several weeks working with his Uncle George (Cathy’s brother). Those days of being together at Gram Young’s ocean-front apartment were both fun and relaxing for all of us. The plane trip from Miami to Belem, Brazil was particularly memorable for me. I had flown overseas only once years before, but because I don’t particularly enjoy flying, I had more anxiety than I should have. Cathy still tells how I looked during that 6 hour flight, and I’m sure it was the way she describes it. She said I just sat there looking straight ahead without talking much and having a white-knuckled grip on the arm rests. I couldn’t close my eyes for very long because my inner ear would give me the strange sensation that the plane was in a slow climbing bank to the left. I remember the large plane (Boeing 767) was packed with returning Brazilian tourists, and the cabin was hot and loud with excited Brazilian children having experienced a trip to Disney World. I kept thinking if we had an in-flight emergency we would be surrounded with people with whom we couldn’t communicate! It was not a fun experience for me, but we finally touched down in Brazil, and I think I was somewhat surprised we made it! On arrival in Belem at 3 AM, we were met by a Mission Board member who assisted us in getting boarding passes for the next leg of our trip to Redencao. At 7 AM we boarded a much smaller twin-engine plane for the trip to Redencao which took another 3 hours. As we flew down the beautiful Amazon with nothing in sight but the rain forest, I asked the flight attendant what we would do if we developed engine trouble. He said we could not land in the trees because they were as tall as 200 feet, and it would not be wise to try to ditch in the Amazon because of the piranhas! He left the solution to my imagination. At this point I was too tired to imagine. Great memories from Brazil. Thanks so much for revisiting those days. Sharon and I cherish those days of ministry with you and Cathy. In writing this remembrance, I went through the many photographs we have and the memories just flooded back of those great days. I have copies of the Tidings regarding the trip and laughed out loud again at the hilarious comments you made under each photo! Thanks to you and Sharon for such great leadership.